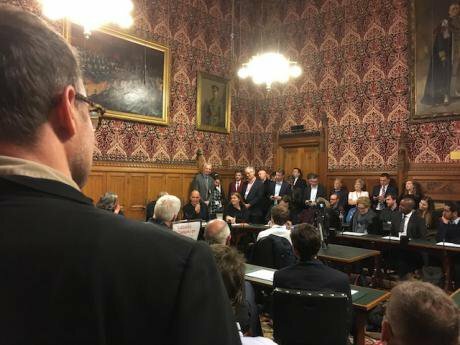 Yanis Varoufakis addressed a packed room of Labour Party MPs and councillors on fighting present and future battles with 'Norway plus', yesterday evening at the House of Commons. 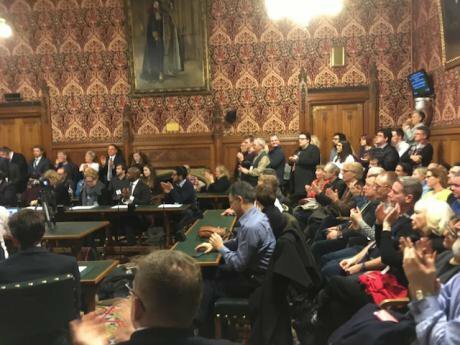 Heidi Alexander MP,Chuka Ummuna MP (chair),Yanis Varoufakis (guest speaker),Alison McGovern MP, in the House of Commons, January 29, 2018.The discussion was hosted by Labour for the Single Market and Open Britain, and chaired by Chuka Ummuna MP. Yanis Varoufakis: The main reason I am here, I believe – I’m going to add back into Chuka’s account a few wrinkles that he omitted out of kindness I suspect – is because I was prepared to advocate a Marxist case for the Norway agreement. As a declared Corbynista and someone who could never be considered a lapdog for the EU but who dedicated every sinew I possess at the time to campaigning against Brexit – nevertheless I am here to present to you the case for what I call ‘Norway plus’ from a leftwing perspective, portrayed as an opportunity to do that which we progressives have been failing to do in the last year and a half, which is the following. 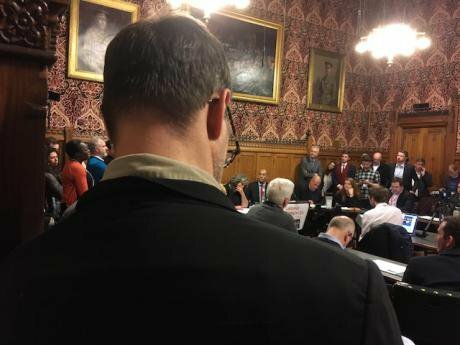 Let’s face it – here in this room we are reeling from a massive defeat in June 2016. We are deflated. A lot of what I have heard is correct but nevertheless defensive. It is as if I am hearing again the arguments which should have been heard loudly before the referendum! Let’s not keep fighting yesterday’s war. Let’s not keep fighting yesterday’s war. I am in favour of a second referendum, but not one that annuls the first one. As a democrat I cannot stand up in front of an audience in Leeds or Doncaster or Clacton-on-Sea, look in the eye people who voted for Brexit and say to them what was said to Irish voters in 2004 – “You voted the wrong way. Go back and deliver the right verdict this time.” But at the same time I believe we have an internationalist duty, a progressive duty to save that which must be salvaged from the Brexit wreckage. The possibility under this government or any Tory government of a decent, mutually advantageous agreement between the United Kingdom and the European Union is vanishingly small if not absolutely zero. So what we must save is firstly freedom of movement. Speaking from my perspective, I do not believe that you can be a Marxist, an internationalist, and believe that the solution to the problems of the working class is electrified fences and new borders coming up between European countries. To those who say to me that this is hypocritical Eurocentrism, because you are still not allowing people from Pakistan and South Africa to come in, my argument is, ”Well, where borders have come down, even if they have come down for neoliberal reasons, for reasons that fit the agenda of big business, we should maintain the absence of those borders. We do not put them up. And we try to extend freedom of movement beyond the European Union to Pakistan, to South Africa." Ideally we want a world in which there are no borders, and one in which our identity, our culture, our democracy and our sovereignty is not defined through the capacity to exclude people from our territory. Of course, the second thing we need to preserve is our supply chains. These are the economic arguments and I am an economist. I can wax lyrical about the disaster that will befall both sides of the English Channel if we move into a Canada- or South Korea-like agreement. But I have to add that tactically, ideologically, it is a gross error to hammer on about the costs of leaving the single market. It works exactly like those anti-drugs posters in the early 80’s depicting drug addicts in the gutter, which drug addicts were quite happy to put up on the wall, identifying with that image. What are those who are fanatical Brexiteers thinking? Convince them that the cost of Brexit is huge, and this is going to make them even more passionately in favour. It’s a bit like the Blitz: the higher the cost, the greater the sense of solidarity that the British people will feel, against Brussels. If you are going to lead with the Norway plus argument that I am arguing, it has to be an inspirational, aspirational message. The greatest supporter of Brexit before the referendum was in fact the Treasury, the Bank of England, Wolfgang Schauble and Christine Lagarde who were sending messages to this country saying, “ If you dare vote for Brexit, Armageddon will descend on you, you will all be jobless and end up in the gutter.” Nothing helped Brexit more than those ludicrous estimates of the effect of Brexit on GDP. And as an economist I can tell you all these micro-economic predictions are a bit like sausages, ‘If you know how they are made you don’t want to touch them with a bargepole.’ That there is going to be a significant, substantial diminution of the living standards of the working class and Britain in general there is no doubt. That there is going to be a significant, substantial diminution of the living standards of the working class and Britain in general there is no doubt. But put no numbers to that process, because those numbers of statistical or econometric prediction are absolutely scientifically irrelevant without a large sample. If you have a small sample, you can’t make any predictions worth their salt, and here we have a zero sample. Previously, there has never been a case of a country coming out of the single market, out of the European Union. Logic may indicate that there is likely to be a substantial cost. But let us not attempt to turn around the debate in Britain on the basis of scare-mongering and estimates of costs that are not worth the paper they are written on. What we should talk about is ‘getting our country back’. Take the Brexiteer argument and just stand it on its head. The only way of getting our country back, whether this is Britain or Greece or Portugal, is by dealing directly with the four crises that are destroying our communities and making people feel that they are not in control of their lives or of their countries. What we should talk about is ‘getting our country back’. What are those crises? In this country, it begins with private debt. It is the elephant in the room, rising inexorably and spearheading the next wave that will push the majority of households into depression – the fact that you have so many British families today needing to use credit cards in order to put food on the table. Secondly, public debt, which is being used as an excuse for ‘austerity’. Thirdly, the worst spate of under-investment in the history of postwar Europe, whether it is in Britain, Greece or indeed Germany. Did you know that Germany has the lowest level of investment since 1951 while at the same time having its highest level of savings ? And fourthly of course the increase in poverty which is the natural corollary of the other three already mentioned. So these are the enemies that we must target. But like climate change, Britain cannot tackle these on its own, France cannot tackle these on its own, Greece cannot tackle these on its own. So that is why, exactly like climate change, we need local action, regional and national action, but we also need pan-European action and I won’t go on now to talk about the global action that we also need. At least we have a European Union and some useful institutions. Let us rethink the manner in which we are tackling the crises that make people feel that they are not in control of their country and wanting to retreat. Let’s invest in the argument in the slogan, ‘Taking back control’, but let us talk about what it actually means for us to get our country back, and indeed who the ‘we’ is in this context, in this country. But let us talk about what it actually means for us to get our country back, and indeed who the ‘we’ is in this context, in this country. This last point is a reference to what I shall be saying about the need to look at Brexit as a great opportunity to rethink the constitutional arrangements of the United Kingdom. The devolution that Tony Blair commenced was half-hearted: it did not go far enough. England is feeling disenfranchised. Brexit is an English toxic phenomenon. It has to do with a discarded working class and petit bourgeoisie in England, who unlike the Scots feel that they don’t have representation, that Thatcherism has more or less completed their deindustrialisation and that there is no one speaking for them even here in this House. So – why Norway and Norway plus? Well, we need to respect the Brexit outcome. Norway does, because Britain steps out of the European Union. The referendum chose Brexit, but it is a binary process which does not specify what kind of Brexit. Had the vast majority of voters not wanted freedom of movement, all that was required was that 1.8% would either be indifferent about freedom of movement or in favour of freedom of movement, and there is no mandate for freedom of movement. So respect Brexit while preserving freedom of movement; small ‘c’ conservatism – it is preposterous isn't it that the Conservative Party which has built up its whole value-system on the basis of gradualism, now wants to blow everything up in one fell swoop!? – and thirdly – allow me now to speak as a Marxist. In the Communist Manifesto, Marx says, “ The communists are being blamed or accused of wanting to take nationality, ethnicity, national pride away from the majority”. And he says, “Well, workers have no country. You cannot take away from them that which they do not have.” There is a very good leftwing Marxist argument in favour of the transnationality that the single market and indeed the European Union is putting forward. Remember that Marx was in favour of Zollverein – the German customs union of 1834. Why? Because he said he thought that it would speed up the capitalist process, and that without this development, you would not have the technologies essential for socialism. I will speak no more about Marx. But you asked me to, so I did. And finally, what, philosophically-speaking, is the most powerful argument for Brexit ? It is a rhetorical question, so I will answer it! “Sovereignty – returning parliamentary sovereignty to this great House.” What???! They butchered parliamentary sovereignty. The Brexiteers are in the process of brutally murdering the sovereignty of this House of Commons. There has been no discussion in the House of what kind of Brexit the country wants. Even the way that European legislation is transcribed into British law has been taken away from this House, and moved to a Tory Cabinet increasingly reminiscent of the Ministry of Funny Walks. The Brexiteers are in the process of brutally murdering the sovereignty of this House of Commons. But suppose that we finally succeed in having a five-year, renewable Norway-style agreement after March 2019. 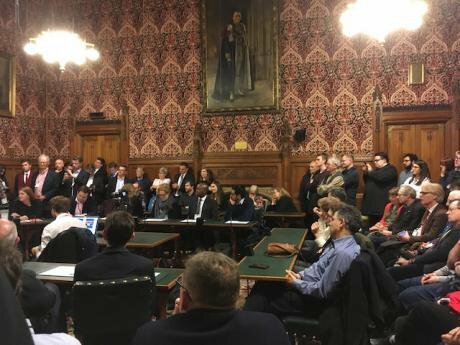 This affords the House of Commons the opportunity to have the debate in peace and quiet and without a ticking clock and a gun pointing at their heads, of what they want in the longer term. One of the great errors of both Remainers and Leavers in this country has been to imagine that the European Union is a bit like a gentlemen’s club here in London, the question being,” Do we want to belong to this? Is the fee justified by the services rendered?” This is a rubbish metaphor. The European Union is in a state of flux. It is a work in progress that in my view, is fragmenting due to the authoritarian incompetence of its establishment. It cannot continue the way it is. Maybe it will collapse. Maybe it will become democratised and turn from an austerity union to a union of shared prosperity. This is what we are working for as DiEM25. But it is not a given. It is a gross error to believe that what Britain does is independent of developments within the European Union. So what we must also preserve is Britain’s presence in European politics, in the progressive movements in Europe that are necessary in order to make the European Union sustainable, democratic and a realm of shared prosperity. And vice versa, we Europeans, whether you like it or not, have to be here, and to be part of the process of turning Britain into a progressive country, of reconfiguring its constitution and ending the Thatcherite traditions that have led as Marx again said, “the second time around” to “a farce” – Osborne, Cameron, Clegg – the awful period since 2010 which depleted so much social capital and created the circumstances for Nigel Farage’s fantastic success in the June 2016 referendum. When I say Norway + – what is the plus? Well, people including some of my comrades in this country and in this party, say to me that the problem with the Norway solution and the difficulty the Labour Party has in supporting it, is because it turns Britain into an EU rules-taker. This of course is correct – this is the price you have to pay for being inside a transnational market. But it doesn’t have to be that way. Britain does not have to be an EU rule-taker if it strikes a Norway-style agreement. Britain does not have to be an EU rule-taker if it strikes a Norway-style agreement. Allow me to be very specific in three areas here. One is labour market standards and protections for wage labour. Secondly, environmental standards and the protection of the environment. Thirdly, financial regulation. Nothing stops Britain in a Norway-style agreement from setting for itself and for any company working within the United Kingdom, higher regulatory standards for the City of London, higher environmental standards, higher minimum wages and higher standards for defending wage labour. Allow me to conclude by going back to the point about the constitutional process. There is no doubt that the European Union needs a constitutional assembly process. Anyone who has read, or even held, a copy of the Lisbon Treaty knows that you cannot read it. It was written by bureaucrats ‘for cretins’, an abomination. It is like reading a Microsoft manual. What is it that unites Americans? When the American constitution was first on offer, 60% of Americans didn’t speak English. But what united them is a text that is only 16, 17 pages long which begins with “We the people”. The act of writing it is what brought them together. We need that in Europe. This is what DiEM25 is striving for in Europe. To have a text, of no more than 20 pages, that redefines European democracy on the level of the European Union, which begins “We the peoples”. Now, we would love you to be a part of it. That is why I want a second referendum that enables you to come back into this kind of Europe by the end of the five year period of Norway plus. But Norway plus must include, at least from the perspective of Labour, using this period to do two things: firstly, democratising the United Kingdom – democratising its institutions to turn it into a genuine federation; either that, or Scotland will leave. Secondly, work with us across the English channel, along the lines of what we in DiEM25 are proposing as a European New Deal. You don’t need to be in the European Union formally to do this. One last example and I will conclude. To its credit in the last election, Labour went to the voters with a proposal for a Public Investment Bank (PIB). You desperately need this in this country. Imagine you create it. So, let us stay together, and let us work towards a Norway plus progressive Brexit that changes Britain, changes the EU, and allows us to imagine the second referendum that will bring us all back together. Britain used to have wage councils that set the minimum wage per sector. Mrs Thatcher saw to it that they were abolished, together (effectively) with trades unions and council houses – thus yielding the present Precariat-Proletariat whose palpable anger and frustration is evident across the land. There is no doubt that we need to bring back a modernised form of wage councils. Not just in the UK but across Europe! It is the only way we can safeguard genuine freedom of movement. Let me explain. The oligarchs in eastern Europe, and elsewhere, want the freedom of moving their money around and the freedom to export surplus labour from their country – people who would rather stay at home if a living wage were available locally. These oligarchs must be told in no uncertain terms: Your freedom of movement (and that of your money) is conditional on legislating a living wage in your own country for your citizens. This is a condition for being part of a European free movement area. And this condition must be imposed by the EU! Why does Brussels think it has a right to come to, say, Greece, to impose cuts to the lowest of the low pensions? How about imposing, instead, across Europe a minimum living wage and pension which terminates instantly involuntary migration, and thus safeguards genuine freedom of movement? Any trade deal with the United States will include stringent clauses which force the UK government to ‘open up’ the NHS to the predatory behaviour of Big Pharma and give them the right to sue the London government in tribunals controlled by private law firms in the employ of Big Pharma. This is no criticism of the Trump administration per se. Looking at the manner in which the Obama administration negotiated both TTP and TTIP, it is obvious that any UK-US trade deal will be detrimental to the NHS’s autonomy from the predatory medical-industrial complex. As for the Brexit dividend for the NHS, it is a figment of Boris Johnson’s imagination: Setting aside the tax decline due to slower growth in the long term (following any Brexit that takes Britain out of the single market), the sheer administrative post-Brexit costs will overwhelm any net gains from not contributing to the EU budget. In short, Norway Plus offers the NHS a shield from the lurking predatory medical-industrial complex and minimises the pressures for further cuts to the NHS due to Britain’s stressed fiscal position. Besides the gross disrespect to those who voted in favour of Brexit (instructing them to go back to the polling stations to deliver what we think is the ‘right’ verdict), the call for a second referendum is fraught with logical incoherence. Any referendum, courtesy of being a binary Yes or No choice, must be clear on what the default is (which will obtain or hold in case the people vote No). Suppose now that, just before March 2019, the government comes back from Brussels with a draft Deal and puts it to a referendum. If voters vote Yes, end of story. But what if they vote No? What happens then? What is the default? One possibility is that a No vote translates into the UK government rescinding the Article 50 process in order to stay in the EU. A violently different possibility is that Britain exits the EU with no deal. Which of the two defaults obtains? By the logic of those supporting a second referendum, another referendum should precede the second referendum, in which voters are asked to choose between the two defaults – thus turning the second referendum into the… third referendum. One only needs to state this to realise the absurdity of the second referendum proposal. But, let’s take this a little further: Suppose that, somehow, it is decided that a hard Brexit is the default of any second referendum. In that case, it is clear that most Remainers would vote Yes to the Brexit Deal brought back from Brussels by the government for the simple reason that it could not be as bad as the hardest of Brexits. Now, if the default of a second referendum was to Remain, then Brussels would suddenly have a powerful incentive to offer London a ludicrously bad Deal – safe in the knowledge that the British voters would reject it at the second referendum. In short, whichever the default, a second referendum is pointless. What was Brexit really about? Those who try to understand the Brexit vote in terms of bean counting (or cost-benefit analysis) are missing the point. Yes, there was a strong underlying economic reason for the manner in which the majority adopted Brexit. But it had nothing to do with a calculation of what the result of the referendum would do to people’s hip pocket. Voters did not behave like homo economicus. (This is where the official Remain campaign, with its emphasis on ludicrous econometric scaremongering got it so badly wrong.) We saw how regions, like Cornwall, that have a great deal to lose from Brexit (as they are net beneficiaries of European structural funding), voted strongly in favour of Brexit. My estimation, the feeling I get, is that the people who voted for Brexit, the vast majority, were not xenophobes, and they didn’t bother to calculate their private expected net benefits from the result. They saw this binary choice as an opportunity to reclaim control over their lives, their communities from an Establishment that treated them like Britain’s last colony. They saw it as a splendid opportunity to give that very Establishment a bloody nose; to inconvenience them at the very least; to make them feel uncomfortable every time they visited their mates in the salons of Brussels, Paris, Milano or Berlin. However much Europeanists kick and scream about Erasmus, and about the costs of interrupted supply chains, the ugliness of new restrictions on movement etc., unless we manage to address their sense of a democratic vacuum, the sense that British democracy has been depleted over the decades, especially after Thatcher, we will remain dumbfounded losers.